Well gosh, with traffic already gridlocked and infrastructure overloaded, it’s hard to feel warm and fuzzy about this new 5.2 hectare mega-development in Kuta spread along 250 meters of beach. That said, the long-disused site where Kuta Beachwalk will be built has been like the missing front tooth of Kuta’s smile for over a decade. An eyesore, in other words, soon to be replaced with this diamond-studded 24K false tooth, or should we call it an implant? The websites of this developments’ partners are loaded with buzzwords and well-crafted lipservice, painting a very pretty, softly greenwashed picture. Talk however is cheap, as we know. Development isn’t. This is a $70 million dollar project. Although that sounds like a lotta dosh, given the scope of the project and its site plans and renderings, there is no way they will be able to afford “luxuries” like environmental and social responsibility. Or the “luxury” of quality. The budget amounts to less than $100,000 per unit of hotel room/retail/resto/entertainment, and the developers are still boasting about providing parking, public plazas with fountains and ponds and performances and pedestrian pathways and plantings. The numbers don’t quite add up. Something else that doesn’t add up: The announcement of this development, slated for completion in 2012, comes at a time when the Governor and other leaders on the island are making public statements about overcrowding, overpopulation, overdevelopment and oversupply of hotel rooms in Bali. They are also crowing about a long-overdue moratorium on new hotel rooms, and about enforcing a law that requires that disused land be given over to the public as greenspace or for agriculture if the owner-speculators don’t do something with it. And they just announced that there are dozens and dozens of hectares of disused land in the Kuta area, some of it beachfront, and big. Furthermore, the Governor just stood firm on a 1000% increase on tax for commercial use of groundwater, which means hotels will be paying dearly for their lawns and gardens and pools and laundry. In response to complaints from elements of the hospitality industry, he said, “Raise your room rates!” And meanwhile, thousands of new rooms are being added to the already oversupplied hospitality sector in Bali? It’s all just too bizarre and convoluted to get one’s head around. Oh, and do I see a waterslide of epic proportions snaking around the entire Beachwalk complex, or is that just my imagination? Susi, warm and fuzzy? Or hot and bothered. Soon the whole island will be homogenized, and we won't know when we travel if we are in Singapore or Bali unless we check the signboards. We are the global village idiots. I am trying very hard not to feel hot and bothered, but failing. Personally, I think this kind of development is unspeakably appalling. I wonder if the Bali Update article perhaps had a typo or if someone clicked the wrong spellcheck suggestion word . . . maybe they didn't mean to write the "gentrification" of Kuta, but the "putrifaction" of Kuta. 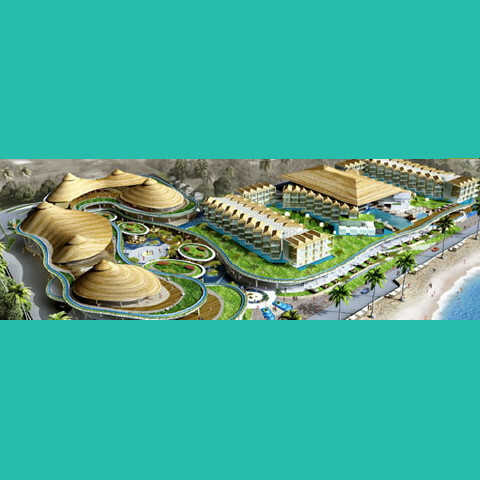 Anyhow, I'll bet you a dime that this Beachwalk thingie turns out to be as haphazardly built, finished, managed and maintained as Kuta Square or whatever it's called, and that other empty decrepit (salah-konsep) concept mall where Ace Hardware is. How can people continue to "not get it" . . . for so long? It will be hard for all of us to reach Paradise. Up there They will be scared of what we can do to destroy every place . Oh and someone wrote to me on Facebook to say that the spiral-limpet roofs of this development bear a scary resemblance to the marvelous Heart of School building at the Green School. Now that is just . . . sick . . . if some designer looked at the Green School and took nothing away from his experience other than a groovy roof shape. Talk about missing the point entirely . . . aduh. Y’know what Rio? I think the immune system of Bali just needs a boost. Think of it this way: When a human being gets a nasty nick on their foot and the bacteria take over and start multiplying like condotels in Kuta, the immune system seals off the offending area. It creates an abcess, where the offending pathogens are sealed in, so they don’t get loose into the bloodstream. The immune system builds boundaries, and isolates the contamination, pending a more lasting resolution to the infection. This saves our lives. We would die of septicemia quickly otherwise. An abcess buys some time, saves the body, sacrifices some local tissue . . . while waiting for someone to burst the boil later. Perhaps we need to declare certain zones of Bali abcesses? Seal them off, let the infection go wild there, and protect the larger body of Bali from a deadly systemic infection? That’s what zoning laws are meant to do, in a sense. They are the idea behind a “development immune system”. Bali's immune system has these ideas, but the immune system itself isn’t working as it should. Personally, I wouldn’t mind if they let Kuta go bonkers and be a Coney Island on steroids for the 21st century. As long as they can contain it. Gosh, some people actually LIKE Coney Island on steroids or off, and who am I to forbid them from visiting such a place? Some people like Soi Cowboy in Bangkok. Some people like Vegas and Atlantic City and Macau. In an ideal world, we could give them all the “pleasures” of those places - - virtually - - by means of simulated reality technologies that they could use at home. Then these monstrosities would never actually need to be built. I mean, seriously, we can surely construct a more satisfying virtual reality for them than the actual reality of staying in the Honky Hotel, wedged between Beachwalk and Hard Rock? Aren't there some interactive online virtual life options that can be optimised for this purpose? Or are we, all of us, wedged between a rock and a Hard Rock place with no alternative but to try to smile while we're being squished? RE Green School Reference: I agree with Susi: it is an harmonious design in synch with its environment ..... they just need to find perma-nerds to occupy the staff housing. P.S. While Burning Man lasts only a few days, Molding Man lasts a whole month. Why? Because watching a big effigy burn takes a few hours, but watching one turn into compost takes a bit longer. It will be such a thrill to circle the Molding Man together and witness the process as it slowly becomes a spongey heap in the tropical funk. How very exciting. And it's so much greener than burning. No carbon footprint, quite the opposite. Take that, you Burners! Am I being a Mean Girl? Kuta can continue its degrading already poor state, just don't bring the mess upto Ubud :-( keep the 'coney island on steroids' attractions in kuta so to keep those tourist who like them stay down there... Starbucks in ubud I hear? what next? KFC? Already too many D&G and circle K~! Hi ETI, Thank you for your comment. I'm pleased to be fostering a lively discussion, and even more pleased that you took the opportunity to add your insights and opinions. In response to points you've raised: Intent is all well and good, but it's results that matter. That said, I do appreciate the various efforts you list to mitigate environmental impacts. Nevertheless, my opinions remain as written in the original post. If there are factual errors, please let me know and I will certainly correct them. My calculations, for example, of investment per room, are based on published information and simple mathematics and they could be off a bit. In answer to your final question, yes "us guys" have done some environmentally friendly things. Oh, and I've been a vegetarian since 1971, which is (with utmost respect) probably before you were born. Cheers, Susi P.S. Just by way of background. I'm not a complete innocent in regard to property development. I was the Director of Marketing and Public Relations at Wright Runstad & Co (Seattle) before moving to Bali fifteen years ago. Hi..I am a student in one of the university in Bali. One of my project is to make papers with topic "Does Kuta Need More Malls ?" I searched recourses to internet, and I found this web. Very suitable for my project because it is discussing about the new developing mall in Kuta. My temporary conclusion is Kuta need no more malls, as it is already crowded and new mall would give bad impact for other markets near it. Do you agree or disagree with me..? Your comment will hel my papers. Thank a lot.. Thanks, Gus! Great cartoon! Keep drawing, keep talking. It is sad reality that commercialization has bad consequences to the environment. Kuta beach is a beautiful beach and it would be a sad if it would be destroyed by these not so beautiful structures.